It's Day Nine of the 12 Days of Homemade Christmas, and today I have another DIY gift for the guys. I'm not sure about y'all, but our house is filled with books. With two floor-to-ceiling bookshelves, two medium sized bookcases and countless boxes overflowing with books hidden in the crevices of our closet, we might as well just hang a sign outside that says "Library." Today's tutorial was inspired by our constant hunt to find any nook and cranny to stash books. Hopefully, this will cut down on the random piles of books that tend to accumulate on our nightstands. This is a perfect gift for the bookworm in your life. My favorite part? It can be done with less than $10. For my set however, it only cost $2.82. If you'll remember, in my last post I mentioned how I tried to do tutorials that utilized the same materials to cut down on the cost. Because I already had the spray paint and glue, it shaved $8.00 off the cost. Not too shabby. First, glue your figurines to the top of the brick. Wait at least 30 minutes for the glue to set. Once the glue is dry, spray paint the bookends. Allow the spray paint to dry. Spray at least two more coats. Allow the bookends to dry. Next, step back marvel at how ridiculously simple this project was and reorganize your overflowing bookshelves. Liked this tutorial? Spread the love and pin this on Pinterest, and be sure to swing back by tomorrow for day 10. So cute and easy to do! I love simple DIY projects that look amazing! Thanks for sharing! It's so easy! I definitely enjoy the more simple DIY projects. I'm slowly working my way up. Hopefully by next year I will have progressed to more difficult projects, but can create tutorials that make things relatively simple. We shall see. Thanks for stopping by Roni! Those eagle figurines look much better in gold than in their original color! :P I call my living room a "library" instead because we have one or two bookshelves against every wall. You pretty much end up surrounded by books and I like it that way! Yes they do don't they. And the cool thing is you can paint them any color you want. I'm thinking of doing a hot pink pair for my nightstand. And I absolutely love books. Fun fact: once upon a time (before Jasmine came along :) I volunteered at a library. I was already spending so much time there and they needed the help so it all worked out perfectly. I've told James, when it comes time to buy our first home. I don't care if it doesn't have a basement or attic or is falling apart. As long as we have space to build our own mini library. 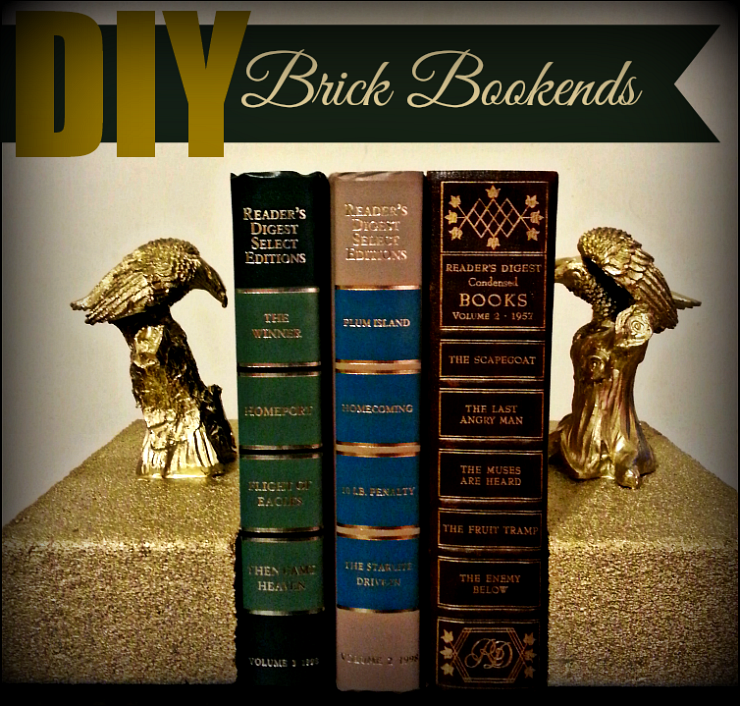 Great idea for diy bookends! Our house is filled with books too.